Since 2006, making creativity come to life has been an integral part of the Mepham Library. Back then we started hostingcrafting days. We made jewelry, had sessions on knitting and origami, and designed greeting cards. We had a MakerSpace and didn’t even know it! When we began reading about this new trend in libraries, we knew we had the perfect space and population for such an operation. What we lacked was funding. So we started small with a carved out nook and a traveling cart that had one base kit of 10 bit modules from littleBits, a Lego brick set, some crafts and household supplies. Once we realized that students had a visceral need to create, explore, and invent, we decided to seek outside funding. The first place we sought financial resources was LISMA, and we received a $500 grant. Along with another grant from our school district and a generous donation from the school’s alumni association, we now had ample money to fully fund this endeavor. For our official grand opening at the beginning of this school year, we enlisted the help of our art department to make us asign announcing the arrival of Mepham’s MakerSpace. When the funds were released, we were able to purchase some more supplies including a deluxe littleBits kit, 3Doodler, Sphero, a MakeyMakey kit, button maker, Silhouette CAMEO cutting machine, vinyl kit, modeling clay, Osmo game system, iPads and more. To get the word out about our MakerSpace, we decided to host some afterschool activities as part of our ELITE (Enriching Learners in Tomorrow's Education) Program. Over the course of the school year, we introduced littleBits, MakeyMakey,Sphero, and Adult Coloring Pages. Hundreds of students used the MakerSpace to craft holiday cards for veterans that were sent to a local hospital. Our leadership classes sought out materials in our MakerSpace to produce buttons and banners for P.S. I Love You Day. Once the word spread, many clubs came in to use our materials to promote events. The support that we received from LISMA helped us to fund projects that benefit our entire school community. The MakerSpace was the perfect environment to partner with our classroom colleagues across all curriculums. For example, in fashioning our littleBits event, we teamed up with an art teacher’s design course. Since we had more students participating than littleBits modules, we formed six teams. Each team had to sketch its design before getting the components to make its invention. This friendly competition stimulated the students’ creativity, and they were able to problem solve when the circuit didn’t work properly. The students went back to the design model and made adjustments to get their project back on track. Using littleBits, students created a prank handshake, a motorized Lego car that operates on the amount of light available, and a windmill generated from our 3Doodler pen whose speed is dependent on the noise level. In these days of high-stakes testing, our overly committed students’ time is limited. The flexible schedule of our library and the availability of resources provide students with many times before, during, and after the school day to access the MakerSpace at their leisure. 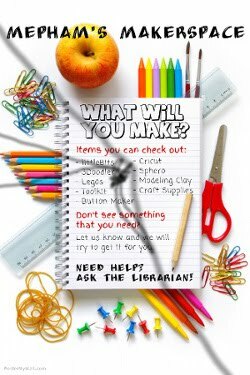 The MakerSpace is just one more example of how our library provides many opportunities to educate the whole student. We continue to seek different ways to approach 21st century thinking and learning. Our hope is that the MakerSpace will spark new interests, expose students to state-of-the-art technologies and unique ways to approach problem-solving. Already seen as the hub of our school, the MakerSpace has solidified our library’s reputation as an innovative and industrious workspace that affects all areas of school life.